Synchronizing calendar entries of Google Calendar and that of the Vertical CRM Calendar is now made easy with the Google Calendar Synchronization feature. Your customers can update the calendar entries in either Google Calendar or your Vertical CRM and have them updated in both. The users should also have the profile permissions for Sync with Google Calendar and the Activities tab, i.e.View, Create, Edit and Delete permissions. The customers need a paid version of your Vertical CRM to enable Google Calendar integration. Log in to the Vertical CRM account. In the Vertical CRM, click Setup > Apps & Add-ons > Google Apps > Calendar. Select the Sync Calendar from the drop-down list. For both 1-way or 2-way synchronization for the first time, 5000 calendar entries for the past 3 months, from Google Calendar are synchronized with Vertical CRM. For the consecutive syncs, maximum 500 entries will be synchronized. When your customers add an event in their Vertical CRM account, it will be synchronized instantly but events from Google Calendar will be synchronized every few minutes. If you delete the sync configurations and again synchronize the calendar events, then duplicate records will be created. 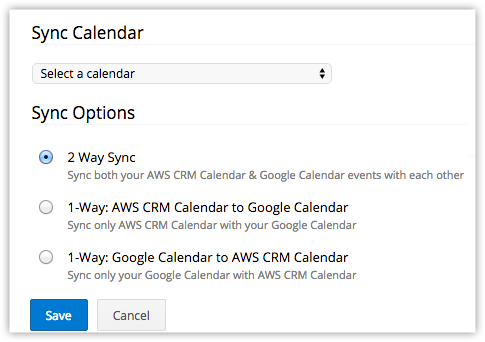 In case of two-way sync, duplicates will be created in both Vertical CRM and Google Calendar. Events added from Google Calendar will be added under by default under the All Events list view in your Vertical CRM. Only the Calendars for which the users have the Read and Write permission will be listed in the Google Calendar drop-down list. In case of two pop-up reminders for the event coming from Google Calendar, only the first pop-up reminder will be added in CRM. Events with no title in Google Calendar will be added with the Subject as "Not Provided" in CRM. Synchronization of recurring events is not supported in the Vertical CRM. In the Calendar Synchronization page, click the Deactivate link.